A Rinkya Blog: Rinkya Japan Weird Food Contest Deadline in Two Days! Rinkya Japan Weird Food Contest Deadline in Two Days! Don't you hate it when the steam from noodles flattens your hair? 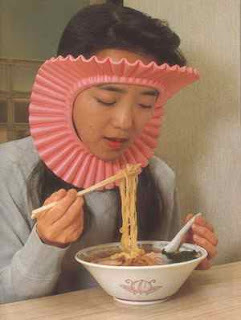 Wear this invention! Please submit your weirdest food/drink item from Japan and the winner will receive a package of the various Kit Kat flavors from Japan! We are looking for the most unique find! Please include a picture and/or link of the item. We will take entries until September 20th!